When is Bitcoin Going to Do Something? It seems like a while since we’ve done our last Bitcoin price analysis, and for good reason. The price movement for Bitcoin has come a crawl! Anyone that’s been monitoring the price over the last few days/weeks has probably noticed that the price of Bitcoin has remained all but frozen in time in the $6.4k-$6.7k. It appears that the price of Bitcoin has remained relatively impervious to any and all news, opinions, and sentiment on it over the last few weeks as well — positive or negative. The following analysis will attempt to answer that question. So, as one can see above, the price movement of Bitcoin has remained as still as can be. Currently, at the time of writing, it is trading at $6,680, which is at the higher end of the range that it has traded in during the past few weeks. Currently, Bitcoin is trading between the range of $6.2k to $6.7k. However, it’s worth noting that Bitcoin has been trading in the upper portion of this range over the last few days without a definitive touch down back to the $6.2k level on the daily beyond a couple of wicks. In the picture above, there is an uptrend line that is connecting a series of higher lows from June 28th to present time. Each box in the graphic above represents a ‘higher low’. Higher lows refers to the phenomenon of each ‘low point’ being higher than the last one. This is typically a bullish development (by itself; bullishness can be invalidated by other concurrent patterns developing on the chart). 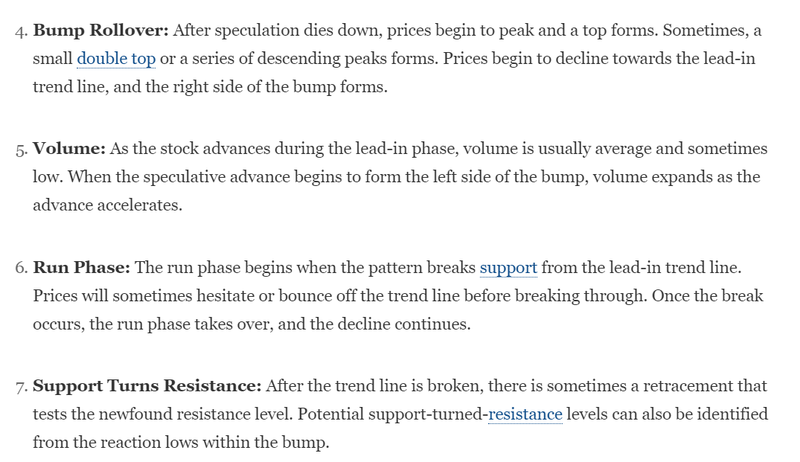 Now, when we refer to an ‘acceleration’ in the price increase, we’re talking about the ‘bump’ in that pattern that occurred on September 18th, 2018. 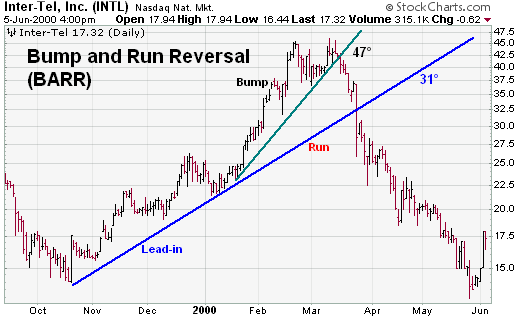 In the chart above, you can see a second uptrend forming on the already existing uptrend. This is referred to as the ‘bump’. The same source as the one cited above fortunately gives us some qualifying criteria for a bump and run pattern. Generally, for the bump to be validated, the volatility should be increasing at just about the same rate that the bump itself is. And the bump’s volatility must be > the run’s volatility. This is not the case for what we see on Bitcoin at the moment. 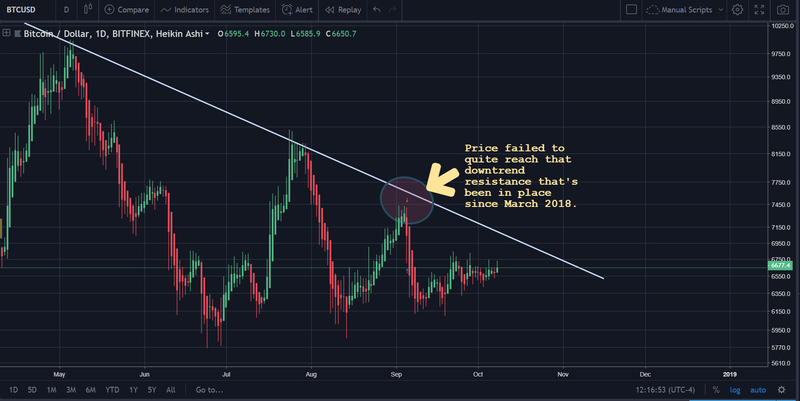 Since we didn’t really get anywhere looking at the underlying uptrend for the price of Bitcoin, let’s see what we can uncover by looking at the overhead downtrend resistance (yes, a downtrend resistance can co-exist with an underlying uptrend support; we’ll get into this later). 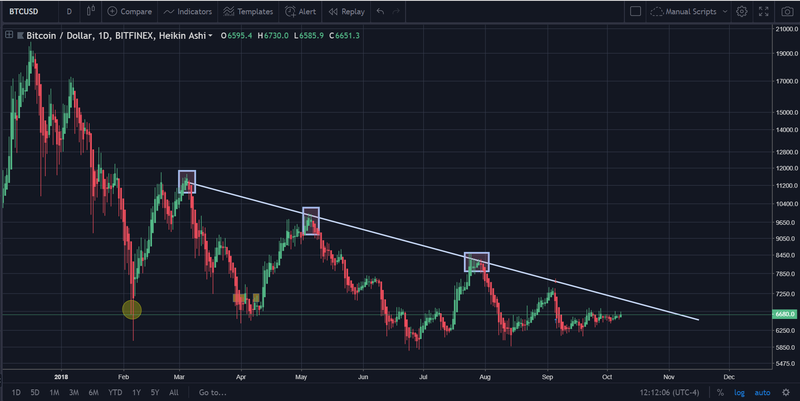 In the picture above, we can see that this downtrend resistance is fairly well-established on the daily and has been formed via the push back points of two major bullish runs in Bitcoin’s price. Now, if you’re looking at the above chart closely, you’ll notice that the last little run up did not quite make it to the downtrend resistance that we identified earlier. Thus, we must draw an additional downtrend line (reverse bump and run ironically), to account for this acceleration in price decline. The result of the Bitcoin price movement that you see above is a ‘moment of truth’ type of scenario. Either the accelerated downtrend resistance will hold, or it will not. 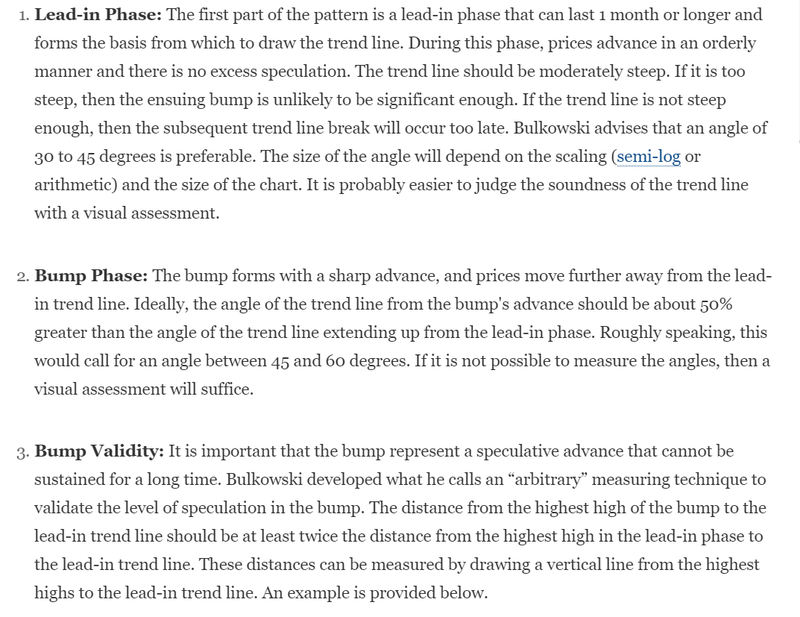 If it does not, then the uptrend wins this round and the price will more than likely continue to travel upward until it meets the longer-term downtrend resistance from March that we mentioned. The answer = At any time now. Disclaimer: As always, do not consider this article to be any type of financial advice! These are merely ideas by the author. The author is entirely divested of cryptocurrency at the moment beyond incidental (dust/business payments) amounts that are not investments, but rather in spare wallets ready to be liquidated at the earliest possible convenience.